Stage 5 is the stage where you move away from New England and Fenway, lucky to see the place even once a year, yet still impart the fandom to your kids…and, in my case at least, wife. This is the stage that a large number of the 40,000 fans at Saturday night’s game in Baltimore come from….and my sister’s family in Allentown, Pennsylvania….and of course, me. We highlight the days on our calendars when the Red Sox will be playing at a stadium within driving distance…we travel five hours with our small children to see the Sox play an exhibition game…..we teach our kids that the blue hat with the red “B” (and, of course, the red hats with the B and the green hats with the B and the pink hats with the B) is the one we root for, despite being surrounded by “W” hats or O’s hats or, in many cases, the dreaded interlocking NY. We miss work (don’t just go in late) to fly around the country to see the Sox play in the postseason. We read the Globe and Herald every day online….even in January. And when we read the Globe, we wish Peter Gammons would go back to doing what he does best, the Sunday notes, and stop his ESPN gig. 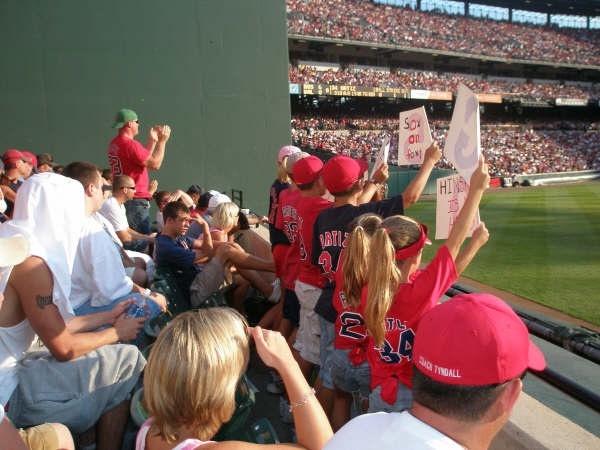 We teach our kids to sing “root root root for the RED SOX” during Take Me Out to the Ballgame. We cover the walls of our basements with pictures of Fenway, and old timers in Red Sox hats (in my case it’s autographed photos of Ellis Burks and the immortal Butch Hobson). We hang Red Sox/Fenway stuff in our offices…prominently. We stand out as Red Sox fans. Fenway Park is a place we only see on our TVs (many people in RSN, in this stage of fandom, panicked when it appeared that DirecTV would be the sole carrier of MLB extra innings) and hear through our radios (thank you, MLB.com!). Our Red Sox experiences these days are in far away ballparks. With that in mind, we revel in walking around a visiting ballpark and seeing the people who make up Red Sox Nation, and of course their Red Sox paraphernalia (evidence that there really is an article of clothing out there for everyone). With a mix of amusement and pride, we laugh as the home fans get increasingly annoyed as they look around and see themselves surrounded…and drowned out…by Red Sox fans. We giddily discuss the vagaries of this year’s squad with our neighbors in the stands…because we can. Where I work, nobody cares about whether Dustin Pedroia is leading off or hitting second. But these people do. My neighbors don’t care that Francona went with Delcarmen instead of Okajima in the eighth inning in a game the previous week…but these people do. It’s our cross to bear and our badge of honor to overanalyze every minute detail of the team. Perhaps more than anything, we get goosebumps when we hear a non-Fenway stadium rise up in chorus, “Let’s go Red Sox” (and are pleased to note the beautifully harsh Boston accent…”Sawx” instead of “Sox”). I have goosebumps reading your blog. I’m not blessed enough to be able to travel around to see my beloved Red Sox. Where I live in Upstate New York however, there is a local bus tour company who has a trip to Toronto every year. I did get to see them then and there were tons of Red Sox fans at the game. The same company has a trip to Toronto to see a game against the Yankees (boo hiss) every year. My nieces are in love with Derek Jeter (another boo and bigger hiss), so I take them, as well as my best friend who is a diehard Yankee fan. And every year, I walk onto the bus full of Yankee fans, and maybe a couple of Blue Jays fans, with my Red Sox jersey on. And every year, when they start giving me a hard time, I have to remind them all that I am the designated Yankee hater on these trips!!! But we have fun and that’s the important part. We were blessed for many years to have a triple A team locally. First it was the Pirates franchise and then the Indians. When I lived in the City, I had season tickets and never missed a game. We would often get a busload of folks together to go to the away games and many times would drive to the games in a caravan. And yes, it sure surprises the players when you all show up. I never got anything other than a general admission ticket for my son for the home games because he would run around outside the grandstand and collect the foul balls and then go around selling them to people. I was part of the booster club and we sure did have a wonderful time. I used to work for a lawyer. One day he was in court and another lawyer was complaining about the rowdy bunch at the ball park that drove him crazy. He told the guy, well I’m sure one of those people that drive you crazy is my secretary. It was – LOL. I had one of those big plastic horns that you blow through and I was really good at it, one of the other guys had a cowbell and still others had bike horns. We were the life of the game at times. I still have many friends that were made during my days at the ball park. 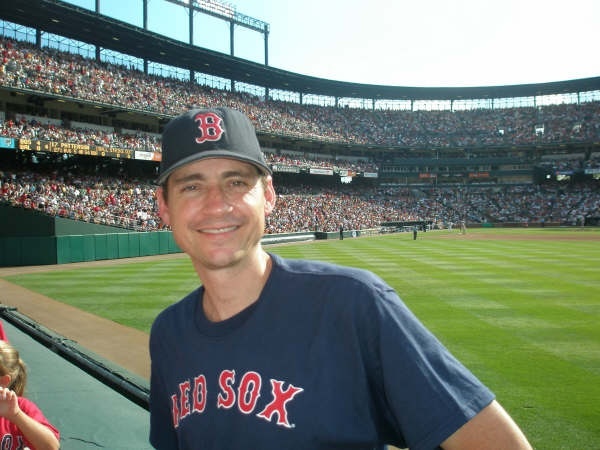 Now, we all need to pray really hard – LET’S GO RED SOX. So they hear us no matter where they are!!! !